At ImHosted, we understand the importance of speed, security, and stability; and have invested heavily in hardware and facilities that ensure your sites are up and running on the web 24 hours a day, seven days a week. Qwest and its Qwest network is built with the industry's most advanced technologies. It offers 10 gigabit, OC-192 speed and is constructed on a "self-healing" SONET ring and 2.4 gigabit (OC-48) Internet Protocol architecture. 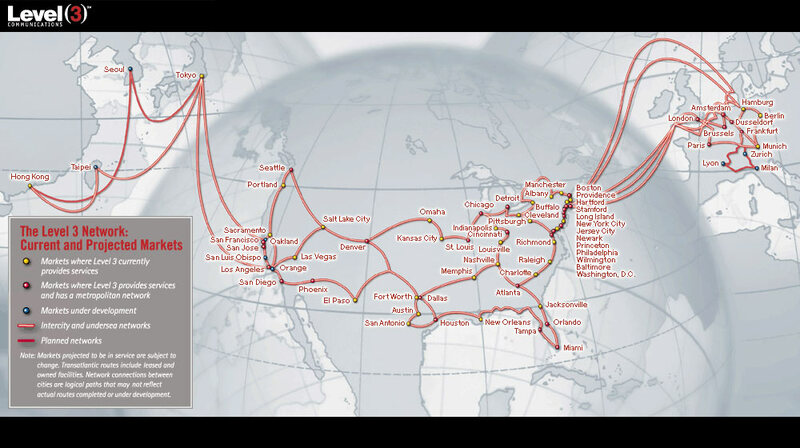 In the US, it reaches 18,815 miles and connects to 150 cities across the country. Level3, is our second Tier 1 Internet backbone. Level3 continues to build-out the first international all IP-based broadband network that's built from the ground up. Extending from the U.S. to Europe and Asia, the Level 3 broadband network already provides the infrastructure Web-centric businesses need today. We are connected to Level3 at 155mpbs (OC-3) connection. Furthermore, because of these unique connections, ImHosted does not need to link to the Internet though an OC-3 or T3 Telecom circuit. Instead, independent cables run inside our building directly from the ImHosted NOC to all two carriers' points of presence. These lines can handle the bandwidth of a T3 or an OC-3 with DWDM. Plus, they handle several times the bandwidth of an OC-3. Whatever your bandwidth needs may be, ImHosted has the scalability to meet them. ImHosted runs the Border Gateway Protocol (BGP4) for best case routing. Our entirely switched, Cisco powered network employs Cisco GSR 12000 class routers running HSRP (N+1 hot fail over) to ensure that data can be routed even in the event of a router failure. The BGP4 protocol is a standard that allows for the routing of packets of information sent out from our network. Each packet of information is evaluated and sent over the best route possible. Because of our redundant network architecture, packets may be sent via alternative routes even if they are being delivered to the same end user. Should one of our providers fail, packets leaving our network are automatically redirected through another route via a different provider. Studies have shown that the most common reason for downtime is circuit failure on Tier 1 provider backbones, the major data highways. To guard against this potential problem, we have two Tier-1 providers. If one experiences problems, we can route traffic down the other one. Furthermore, because we are OnNet with Qwest and Level3, we share their digital distribution architecture, which includes private peering network connections to major Internet carriers such as MCI, Sprint, UUNET, EUNET, AT&T, AOL, Best, Erols, @Home, IBM Advantis and others. These private peering arrangements allow Imhosted to exchange packets of data with every major backbone carrier in a one-to-one environment quickly and efficiently. Industry analysis reveals that 70% of downtime over ten hours with any ISP is caused by telephone circuit failure. Since our NOC is in the same building as Qwest and Level3, circuit failure is virtually eliminated because there is no phone circuit between us and our providers. Instead, there is a direct connection between our Cisco routers and theirs. ImHosted's providers also have peering connections with other major Tier 1 providers, which allows traffic to be switched to alternate backbones should the need arise. Too often providers operate their networks at three to four times responsible capacity. As a result, their corresponding transfer times reach over 300ms. ImHosted's network daily average is 30% of its capacity, with midday peak spikes reaching only 35% capacity. ImHosted guarantees clients will be carried off our network in less than 80ms over a five minute average at any time of day or night.